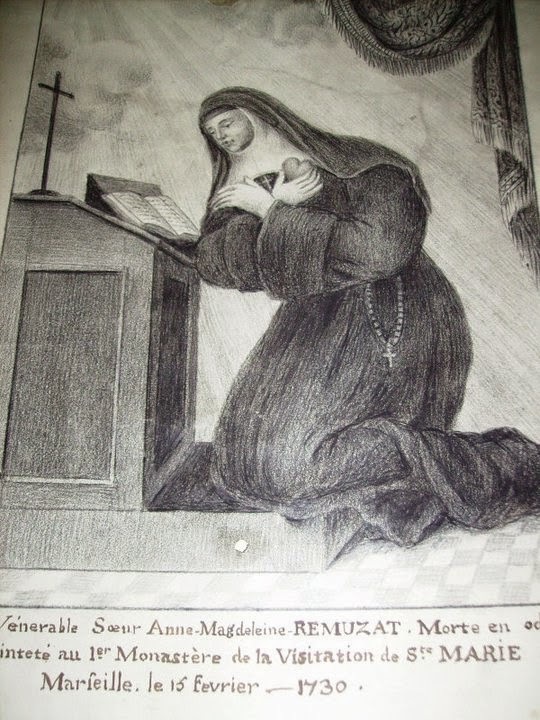 In 2014 the procedure for the beatification and canonisation was set in motion in Marseilles for Anne-Madeleine Rémuzat (1696-1730), Visitandine nun, visionary and propagatrice of the Cult of the Sacred Heart. On the face of it, it is hard to see why this has taken so long; it would seem Anne-Madeleine has all the prerequisites for a Catholic saint - miraculous visions, asceticism, determined prosecution of her mission. In fact, of course,it is far from that easy! There is a very specific and labyrinthine set of rules, with clearly laid down stages and a number of hoops to jump through before anyone becomes a saint! Unless an individual is "fast-tracked" like JPII, it can be a very prolonged process indeed. The Cause has so far passed through only the preliminaries. 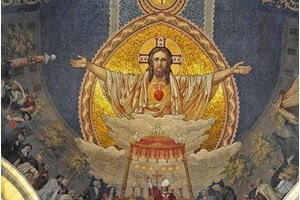 A postulator to oversee the proceedings was appointed in 2009, Monseigneur Jean-Pierre Ellul, Rector of the Basilica of the Sacred-Heart in Marseilles. In February 2014 the Roman Dicasteries gave their formal permission to proceed (nihil obstat - "nothing stands in the way"). On 15 February 2014 the diocesan inquiry opened in order to begin assembling the relevant documentation and testimony. If all goes well, the Cause will in due course be referred to the Roman Congregation for the Causes of Saints for further investigation and adjudication. To achieve Beatification, the first stage on the way to Sainthood, there must be an approved miracle, which is evidence of the intercessionary powers of the individual and thus of their union after death with God. In practice this is almost always a miracle of healing. A second miracle is necessary for subsequent canonisation. Like so many aspects of Catholicism, the proceedings are a weird combination of medieval mindset and bright modernity; as part of the appeal for evidence Anne-Madeleine now has an officially recognised blog and a Facebook page. However, the task facing Mgr Ellul is daunting. Anne-Madeleine's life is not well documented. A Vie was published in 1760, only thirty years after her death, but the sources on which it was based have largely been destroyed during the Revolution. The blog maintains that posthumously "many miracles have been attributed to her" but is ominously short on specifics. The only published fruit of the diocesan inquiry so far has been a report on the biomedical examination, begun in December 2011, of the heart of Anne-Madeleine, preserved in a reliquary in the Basilica. After Anne-Madeleine's death, the customary autopsy had revealed various marks of sanctity, including a small raised and inflamed area on her chest corresponding to the pain she had felt when Jesus mystically placed her heart within his. Sadly, this new investigation has yielded nothing so mysterious, nor has it corroborated the idea that the heart had been miraculously preserved. The report concludes that the heart had not been naturally (that is to say "miraculously") conserved but merely embalmed according to the practices of the time, using myrtle honey and lime.